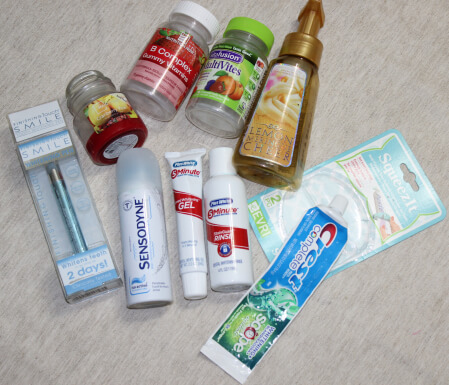 Beth and Beauty’s May 2014 Empties, Let’s talk trash! Finishing Touch Smile Tooth Whitening Pen – I bought this from Amazon.com. I have stained teeth of being a smoker for about 25 years, plus they are very sensitive. This product did seem to whiten them a little and with no sensitivity. Yes, I would repurchase. Sensodyne Whitening Toothpaste: This was like a foam toothpaste that is suppose to whiten sensitive teeth. Well, it did not whiten my teeth and my teeth hurt along with my gums and bottom lip. No, I will not repurchase! Plus White 5 Minute Premier Whitening System, Speed Whitening Gel: Yet another whitening product I tried to whiten my poor old yellow teeth, nope, it did not work either plus it hurt my teeth and both my gums and bottom lip hurt also. No, I will not repurchase. Plus White 5 Minute Premier Whitening System, StainGuard Rinse: This is the rinse that came with the above gel, I bet you know if I will repurchase this or not- you are so right, NOooo I will not repurchase. I have came to realize that my small, yellow and brittle bottom teeth is going to look yellow. I get them cleaned twice a year so I know they are clean. I look at it as a reminder that I should not have smoked all those years. So glad I have now been a non-smoker now for over 2 years. Crest Complete Multi-Benefit Whitening Scope Outlast Toothpaste- I used all this product and it didn’t whiten my teeth that I can tell but my teeth felt clean and my breath was fresh. Plus, it is the only whitening toothpaste that hasn’t hurt my teeth. Yes, I would repurchase if on sale. The Crest toothpaste is laying on the empty packaging of what my 2 toothpaste SqueezIt Tube squeezers came in. These are the neatest little do-dads that I have ever seen. You just put them on the end of the toothpaste tube and move it up as you use the toothpaste and you end up using all the toothpaste that is in that tube. I know you probably already knew about these things, but this small town little girl just found them and I am amazed. They were also just $2 at WalMart. Back to the top roll, a Mainstay Cranberry Pear small candle: it smelled good and it was cheap so yes I would repurchase. Vitamin B Complex Gummy Vitamins- I use 2 of these a day, so yes I would and have repurchased. Vitafusion MultiVites Complete Multivitamin Gummy: I have to take 4 of these a day. Vitifusion is my favorite brand of these, so yes I will and have repurchased. Bath & Body Works Lemon Meringue Cheer Anti-Bacterial Foaming Hand Soap: I love Bath & Body Works Foaming Anti-Bacterial hand soaps and I always keep a lemon one in my kitchen. Yes, I will repurchase. Sample of Thierry Mugler’s Alien Perfume: It had a good floral but woody scent. I liked it and if it was on sale, I would purchase it. I don’t buy a whole lot of perfumes due to my allergies. Travel size of Secret Antiperspirant/Deodorant Invisible Solid: Secret is my favorite brand of deodorants so yes I will repurchase. I love keeping these travel size packages for me and my husband’s get-a-way weekends. 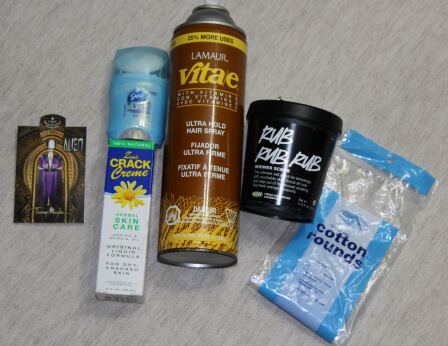 Under the deodorant is the box/bottle of Zim’s Crack Creme: Don’t laugh, Oh! go ahead, I did too, the first time I heard of the name. This was recommended by another blogger for very dry and cracked skin. I bought it and I just can not use it because it smells horrible. When I throw away a product because I can’t just suffer through it, then you know it smells very horrible. LAMAUR Vita/e Ultra Hold Hair Spray: I have had this for a very long time and I use to use it all the time. I finally did use it up and it is a good hairspray that doesn’t make your hair feel like straw, but the hold is not the greatest. I might just repurchase this because it is good for those days when your hairstyle doesn’t call for a lot of holding power. I just thought of this while typing this post, but I bet this would be a good backcombing spray. You can find this at Sally’s Beauty Supply. Lush’s Rub Rub Rub Shower Scrub: This is a wonderful smelling and blue body exfoliant you use while in the shower. I am telling you it smells amazing!! Yessss! I will repurchase as soon as I can get to the nearest Lush store, which is 2 hours away. Assured 100% Cotton Rounds: I got these at the Dollar Tree, they did the job but meh! I would repurchase if necessary but I would prefer my Cotton Clouds or Walgreens Organic Cotton Rounds. Bottom Blue Mascara Tube is the Avon’s Aero Volume: I started out really liking this mascara but within about a month it became so gooey that I could not use it any longer. No, I will not repurchase! Black sample right above mascara is the Giorgio Armani Silk Foundation sample in light: I have found with these type of little samples I can not really tell if I am going to like the foundation or not. I will have to get a larger sample to use for a couple of days to really be able to say whether I would purchase it or not. 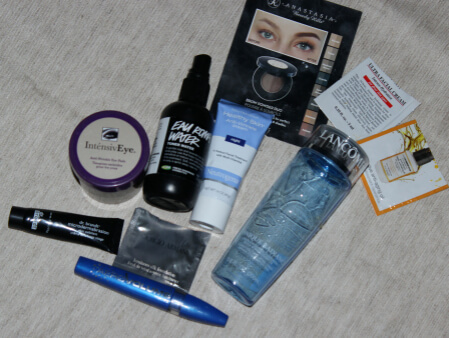 The little black tube is Dr. Brandt Microdermabrasion exfoliant: I got this in my April Ipsy Glam Bag and I love this but it is too expensive for me to justify. I believe it is like $80 for 1 oz. Purple/Tan container is IntensivEye Aniti-Wrinkle Eye Makeup Removal Pads: One word, Awful!!! I got these at TJ Maxx for $3 and they were not worth that. Sad, just sad! Black pump bottle is Lush’s Eau Roma Water toner water: I loved this toner and I will be repurchasing as soon as I can get to a Lush Store. Blue/White tube is the Neutrogena Healthy Skin Anti-Wrinkle Night Cream: This really burned on my face, so I stopped using it and am trashing it. Lancome Tonique Radiance Exfoliating Toner for normal/combination skin: I used all this product but I feel it is a little to drying for me so I will repurchase a Lancome toner but the one in the pink bottle for sensitive skin. Anastasia Brow Powder Sample in Dark Brown: I love Anastasia and I used this sample up and when I run out of my full size of brow powder I will repurchase. Kiel’s Ultra Facial Cream Intense Hydration Face Cream: Again with these small samples I really can’t say whether I will purchase, it felt good going on and my face was smooth in the morning is all I can say about it. Ole Henriksen Pure Truth Youth Activating Oil: This stuff had such a bad smell, I don’t need another sample, NOooo! I will not purchase. Thank you for stopping by and going through my trash with me. Remember I just finished these products up this month, that doesn’t mean I purchased them this month. As noted above some products were just trashed. Please feel free to leave any tips, suggestions or questions in my comment section also. I read and reply to all of them. 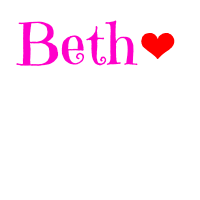 I hope you have enjoyed your visit to Beth and Beauty and you have decided to stay awhile by subscribing to my blog by email, BlogLovin, or Google+. We can also connect through any of my social media outlets. Just click on the corresponding social media icon. I am just a click away. Beth and Beauty’s Makeup Eraser Review: Does this really work?? Wash Eraser prior to first erase! Washing instructions were on tag and they were to: machine wash cool delicate and tumble dry low. Wet portion of Makeup Eraser…..Drenched Wet! Use Warm Water. 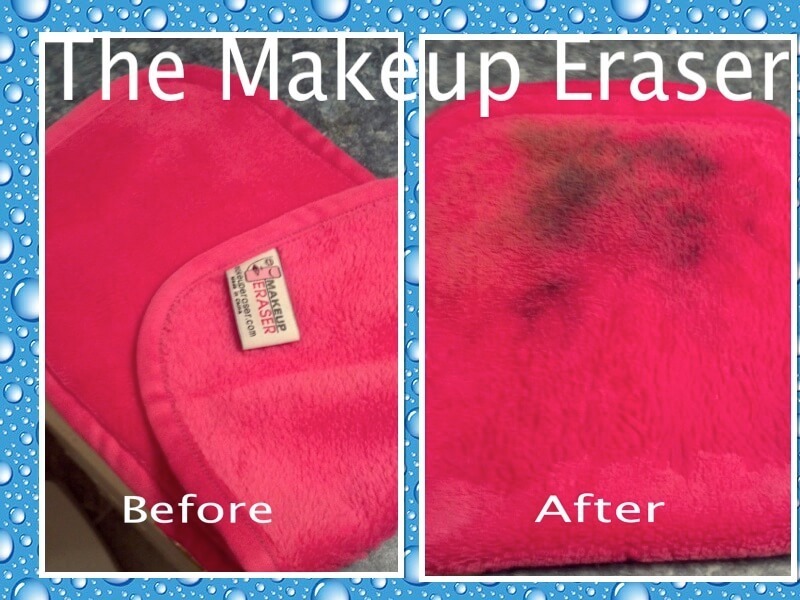 Erase by gently rub off makeup in circular motion. Then flip Eraser to long nap side to exfoliate! Wash Makeup Eraser as needed. I was very careful to follow directions, which as you can see, were very simple. The cloth, as you hopefully can see above, does have 2 different type of sides, one side has a slightly shorter nap than the other. I have to be honest if it wasn’t for tag on the longer nap side then I would not have been able to tell the difference between the two. Most especially when it was wet. So, lets get to the review or Does this thing really work? I got this phrase from watching Grav3yardgirl’s YouTube Videos where she does reviews of items that has the “As seen on Tv” Logo on them. If you have never watched any of them click on her link and you will laugh so hard plus learn about the products. Ok, back to review, I drenched the short nap side with warm water and I gently rubbed in circular motions to wipe off my makeup. Then flipped Eraser over to the long nap side to exfoliate. This worked somewhat okay for the face makeup but my eyes, I felt I had to rub to hard on them to get what I did off. You can see the before and after picture of my face above. I also included a picture of the cheap Forever 21 Lavender Makeup remover wipe I used after using the Eraser and the Cotton Round with my eye makeup remover on it after the Eraser. Lastly, I included a picture of the 1/2 cotton round with my toner on it that I used on my face after using the Eraser, makeup wipe and my Clarisonic with facial cleanser. Sad to say, I do not believe the Eraser works at all! When I use my Lush makeup remover lotion, makeup wipes and my Clarisonic Mia 2 with cleanser, I rarely, if ever, have any makeup come off on my cotton round using my toner. As you can see above, I had quite a bit on the toner drenched cotton round. 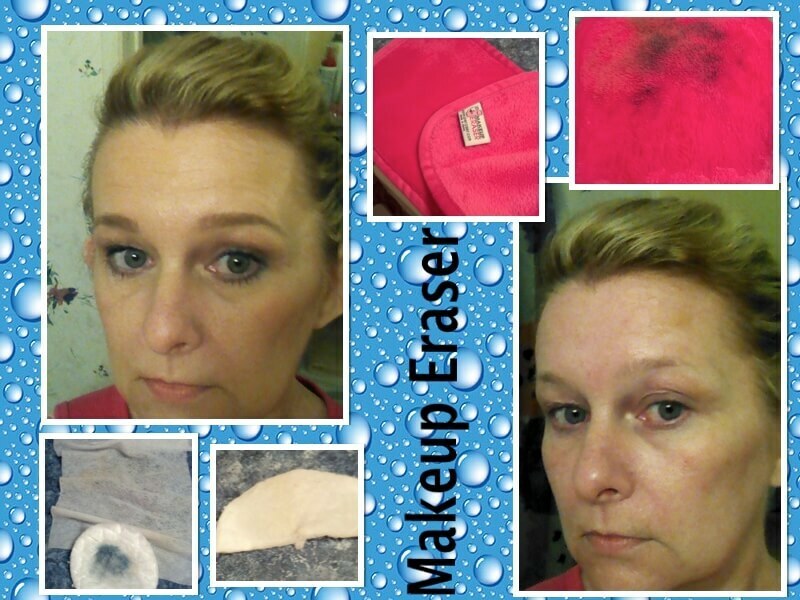 I am going to share with you below another close up before and after picture of the Makeup Eraser. I want to also make sure you know, I did not have any type of special makeup on either. I had just used a Clinique CC Cream sample as my foundation and I even just used a drug store Rimmell Mascara. It was a light makeup day. I was sad that this did not work as the product claimed to work! The packaging claims by buying this you will save $1,000’s with the Reusable Makeup Eraser. I do not agree, I guess you could use this wipe and put the makeup remover on it instead buying the disposable makeup wipes. But, that is not how this product is advertised to be used. It says clearly on their website and packaging that this eraser is suppose to remove all your makeup with Just Water! Now Miranda from Slashed Beauty just did an review on a washable wipe that comes in a package of 3 that she really liked and when I commented on her post that I had just got the Makeup Eraser, she commented back and asked me to do a review on this because she had heard about this one and wanted to know how I like it. If you want to see the cloths that Miranda tried out for her blog Slashed Beauty click here. Thank you for stopping by Beth and Beauty today! I hope you enjoyed your visit and have decided to stay awhile by subscribing to my blog. You can do this by either email, Google+ or BlogLovin. I would love for you to also follow me on Facebook by clicking the “Like” button. If you have any tips, suggestions or questions please feel free to leave them below in the comment section. We can also connect through any of my social media outlets, just click on the corresponding floating icon you would like to use and I am just a click away.